Monday nights, 7:00 - 9:00 p.m. in the band room at Casa Grande High School. If you must miss a rehearsal, please call 769-9521 (Arlene) beforehand. If you borrow a music folder to practice, leave the "inside" folder on your stand with your name and phone number on it. Any music that is borrowed MUST be returned for the next rehearsal, one way or another! There is a "piggy bank" which circulates during rehearsal, for donations to the music-and-supplies fund. Band members are encouraged to contribute. Looking for updates or events? No Facebook login is necessary. Pre-concert rehearsal/warm-up begins at 6:45. The multi-use room, where most of our evening concerts are staged, is on the east side of the campus, facing Casa Grande Rd. 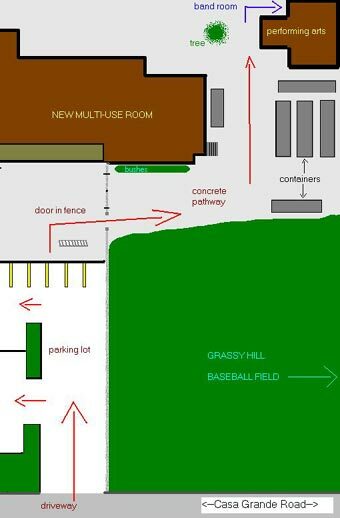 The band room, where we rehearse, is also on the east side of the campus, adjacent to the ball field.